“Mad” Mike Hughes – science denier, flat Earth poster boy, daredevil, adrenaline junkie, scrap yard tinkerer, unflappable inventor – had every intention of launching himself in a homemade rocket a mile across the Mojave Desert at 500 mph between 2 and 3 pm this afternoon. Ever the optimist, Mike persevered when his modified motorhome launchpad broke down in the driveway, sadly fate had other plans. Federal authorities delivered a launch cancelling blow – seems landowner permission to launch a homemade steam powered rocket isn’t enough to satisfy the Bureau of Land Management. Ever the optimist, Hughes isn’t bothered by minor set-backs, he plans to try again next week in a location meeting land management guidelines. Flat Earthers believe Earth is a disc with Arctic centre and 150 foot Antarctic ring wall guarded by NASA employees – government sentries enlisted to prevent hapless citizens from climbing the ice wall and falling off into oblivion. Curiously the Sun and Moon are spheres, each a preposterous 32 miles across circling 3,000 miles above the surface of flat Earth. Stars parade back and forth 100 miles above pipsqueak Sun and Moon.Conspiracy scoffs at the illusion of gravity, flat earth couldn’t possibly possess downward force – it does however accelerate upward at a rate of 32 feet per second squared courtesy forces of dark energy. 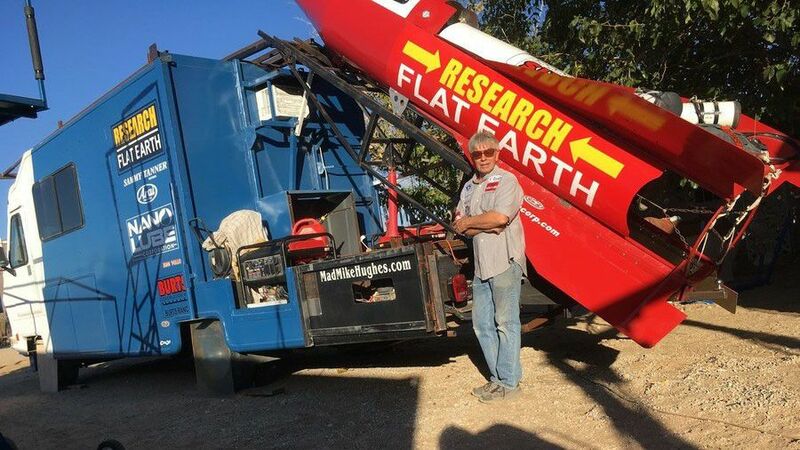 Back to Mike Hughes, the 61 year old Limo driver/junk yard flat earth tinkering inventor poised to launch a homemade steam powered rocket above California’s Mojave dessert this Saturday. To be clear, Mike is unquestionably “mad”, not so clear – motivation to launch a contraption promised to carry him a mile at speeds reaching 500 mph, culminating in ejection and parachute delivery back to flat Earth. I doubt painting “Research Flat Earth” on his rocket will afford Mad Mike an opportunity to prove Earth is flat. Still, you have to acknowledge plucky resolve and determination. Undeterred by consequences of his first rocket launch in 2014 (walked away after traveling 1,374 feet, collapsed from effects of G-force, 3 days flat on his back to recover) come Saturday Hughes will feed his 4 cats, heat 70 gallons of water in a steel tank, blast off in a homemade rocket attached to a launch pad made from a motor home purchased on Craigslist for $1,500. If all goes well, Hughes plans to run for Governor of California.